The rejuvenated Healing Garden at Southlake Regional Health Centre in Newmarket, Ont. 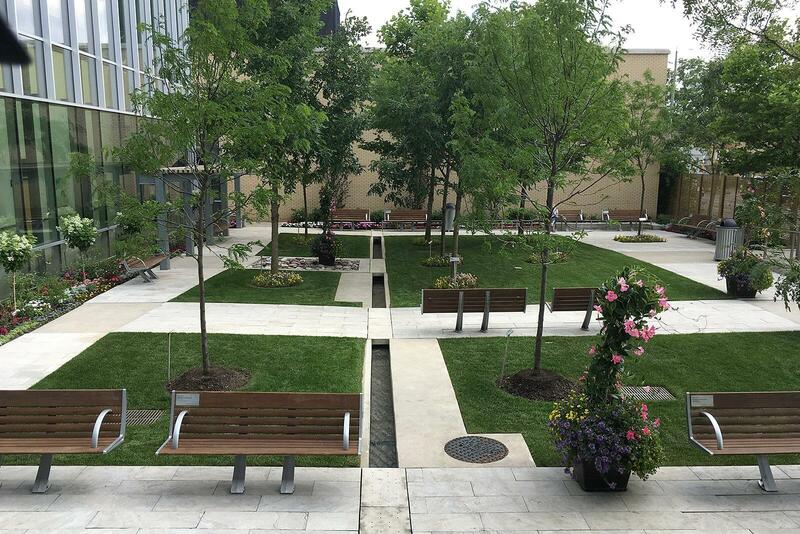 In June 2017, a special event was held at the Stronach Regional Cancer Centre at Southlake Regional Health Centre in Newmarket, Ont., celebrating the grand re-opening of the Healing Garden — a beautiful outdoor space that was totally rejuvenated by Brian Miller and his team at Dusty Miller Landscaping, with the help of many other landscape professionals. Miller’s involvement with Southlake goes back over a decade and includes other members of his family. Before passing away from cancer in 2006, Brian’s dad, Pete Miller, was a long-time volunteer at York County Hospital (now Southlake). The senior Miller would dress up as Santa Claus and visit with patients and kids at Christmas time, bringing smiles to their faces. “I suspect he got just as much out of it as they did,” the younger Miller says. After his father’s passing, Brian felt the need to give back to the hospital that had taken such good care of his father. The Pete Miller Memorial Golf Tournament was born and the annual event has raised close to $300,000 for Southlake’s Foundation since 2007. Through his charitable work with Southlake, Miller attended a donor recognition event in the Healing Garden at the hospital. A talented and accomplished landscape professional, Miller noted the maintenance of the garden was not up to professional standards and saw an opportunity to create something truly special for patients and families during their difficult times. Miller was with his “go to” person, Corinna Jones, Specialist, Philanthropy and Engagement, Southlake Regional Health Centre Foundation, and inquired about the possibility of totally revamping the Healing Garden into something very special. Through his strong relationship with Southlake Foundation, Miller met with the hospital’s facilities manager and got the thumbs up to proceed. At that meeting, Miller says he made it very clear he wanted complete control to do the job his way in order to get the job done and get it done quickly. “We’re known for our exceptional work and quality, so there is absolutely no issue there at all,” Miller explains, noting he took the same approach as he does with a residential client, often saving thousands of dollars in design fees, time and revisions. Companies who donated to the project were encouraged to attend the official unveiling in June 2017. Photo courtesy of snapd Newmarket. In the fall of 2016, most of the removal and prep work was done on site. “We wanted to do as much in the offseason as possible to lessen the impact to the business,” he explains. Miller is highly-appreciative of his hard working staff who never complained, even while installing sod in the rain and snow in December. Later that December, Miller’s suppliers decorated the garden for the holidays: adding lights to the trees, a decorated Christmas tree and Miller providing seasonal flower pots. The work created a lot of excitement around the hospital, as Miller was still the only person privy to the final design. Work continued in the spring of 2017. The water feature was fixed and the stone cladding was repaired. Plant material was installed in May and annuals planted in June, ready for the grand re-opening. As a key part of the Stronach Regional Cancer Centre, the Healing Garden was specifically designed as a peaceful, non-clinical environment to promote healing and reflection for patients and visitors alike as they cope with one of life’s most difficult journeys. Without that community, Miller would not have been able to realize his vision. He is grateful to many, including Tree Valley Garden Centre for donating all of the trees and plant material, and Beaver Valley Stone for supplying hardscape material. Others donated time, labour and materials. To keep all of his hard work intact, Miller has offered his services to maintain the garden for one year. The hospital has a regular maintenance contractor, but Miller is actively meeting with hospital staff and educating them on what a professional service he can bring to the table. Miller continues to support Southlake initiatives. The money raised from this year’s golf tournament went towards a campaign that will help to increase the number of hospice beds in York Region. Susie has spearheaded her own fundraising initiative to benefit Southlake’s Cancer Program. Her broken butterfly campaign allows donors to buy a keychain where one half is kept by the donor, the other half hung from one of the locust trees in the healing garden. Miller had originally thought of making the Healing Garden attractive to insects and butterflies, and thanks to Susie’s endeavour, there is a permanent presence of butterflies within the garden. While showing Southlake Foundation staff the Christmas decorations in the garden last year, Brian asked if anyone had continued to visit the kids at Christmas as Santa Claus. Jones explained there was a retired doctor who had done so, but was no longer able to. Brian seized the opportunity. “Now you’ve got someone,” he replied, happy to follow in his father’s footsteps. In 2016, Brian, dressed as Santa Claus, accompanied by his daughter and niece as Santa’s helpers, carried on the tradition started by this father so many years ago. A plaque in the garden recognizes the collaborative effort spearheaded by Brian Miller.